In mid-1965, the first USAF aircraft was shot down by a surface-to-air missile, the SA-2. To counter this threat, a quick-reaction program was put in place to modify five two-seat F-100F Super Sabres into the first Wild Weasel aircraft. These aircraft had a rough time in their first weeks in theater as tactics to evade a surface-to-air missile had not yet been fully developed and experience proved expensive. Nevertheless, F-100Fs were able to 'ferret' out the FAN SONG radar sites and mark the these targets with rockets and gunfire. The F-100Fs operated in a hunter/killer team concept with one F-100F and a flight of F-105s loaded with bombs. The whole time on station, the team forced the North Vietnamese (Soviet) radar operators to stay off the air while USAF strike flights could safely hit their targets and 'get out of Dodge'. When the 'killer' Thud pilots had enough, they'd egress at the speed of heat, leaving the 'hunter' F-100F to motor out as best it could. Such became the reality of 'First In - Last Out'. It became quickly obvious that the Wild Weasel needed an aircraft to keep pace with the aircraft it escorted. The F-105F two-seat Thunderchief was the next logical choice as the aircraft had the speed, range, payload, and even room inside the airframe for the improved sensor suite. These 'EF-105F' Wild Weasels could carry their own bombs to target, but these aircraft were also updated to carry the first anti-radiation missile (ARM) - the AGM-45 Shrike. The good news was that the Shrike would home on the FAN SONG radar and destroy the control van, the bad news was that the Shrike's range was shorter than that of the SA-2, the Weasels still had to evade the SAMs to strike their targets. The 'EF-105F' Weasels were upgraded into F-105G configuration with more improved electronics and a new missile, the AGM-78 Standard ARM. The AGM-78 was essentially the same airframe used as a surface-to-air and surface-to-surface missile by US Navy destroyers and cruisers, modified with the anti-radiation sensor in the nose. This missile could be shot outside the SA-2's maximum range, but in those days, those SAM operators that survived the earlier Weasels knew that they could differentiate the flight profiles of strike aircraft verses the Weasels. If a Weasel was heading their way, they simply shut down the radar. If the radar went off the air, the Shrike missile had nothing to home on and became a high-speed unguided dart. The Standard ARM allowed the Weasels to target a SAM site without flying toward it. They could shoot the missile away from the intended target and then program a turn into its flight profile that would take it 'home'. The F-105G was supplemented, but never replaced by the 'EF-4C' Wild Weasel, but eventually the Thud was replaced with modified F-4E Phantom IIs that became the F-4G. 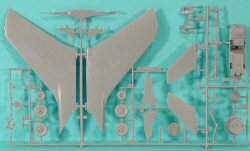 The Monogram two-seat F-105 in 1/48 was first released as the F-105G, typically molded in green styrene and later re-released as the F-105F. The latter release lacked AGM-78, special launch rail and pylon, ECM fairings, etc., you can see on that last gray parts tree. 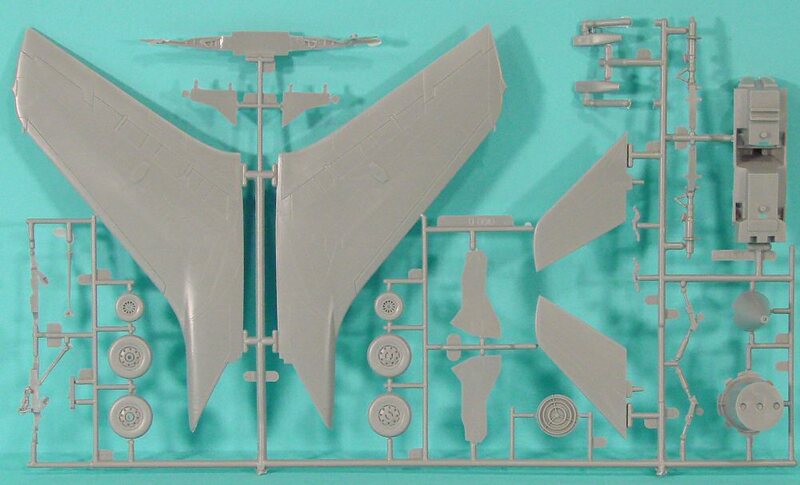 This release is molded in light gray styrene and presented on five parts trees, plus a single tree of clear parts. 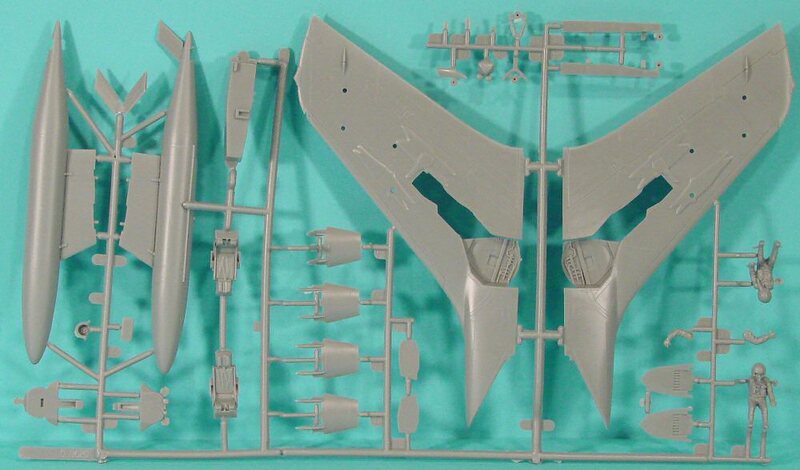 Like the other members of the Monogram 1/48 Century Series, this kit features a very detailed cockpit, decent ejection seats, and some nice all-round engineering. The kit provides a main spar that extends out of the sides of the fuselage to ensure that the wings are properly aligned and reinforced after assembly. The stabilators had a single pin instead of a tab to mount them to the fuselage, allowing the stabs to be posed instead of standard kit-maker 'neutral' position using a tab. The speed brake pedals around the tail pipe are posed with the bottom one hanging as seen after engine shut down. Stop here to see some examples of that. If you want to model the Thud powered and crewed up, simply modify the pedal to close. As with other members of the Monogram Century Series, this kit is an easy build and is very detailed straight out of the box, even by today's standards. 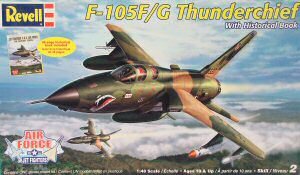 This is still the only F-105F/G in 1/48th scale though it has been released by Revell, Monogram, Revell-Monogram, and Hasegawa with different kit numbers and decal options. 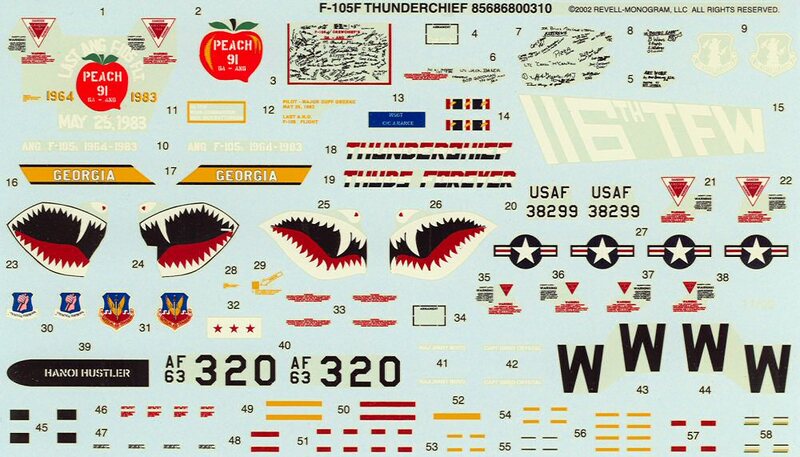 Trumpeter did release their F-105G in 1/32, but with all of the shape problems with the kit, I still declare this model as the best F-105F and F-105G in any scale. While this kit is currently out of production, it is one of those kits that gets released periodically and is still in good supply at kit swaps and even eBay.